Kids Club kicks off the Lunar New Year by celebrating the Year of the Dog. To generate some good luck vibes we will be making a dog sculpture from clay. Let’s dive deep into the ocean and create a wild and washy watery under world scene. We’ll use coloured paper to make a menagerie of brightly coloured crazy animals. 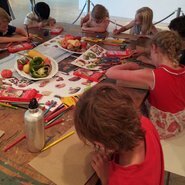 We will make a gorgeous garden of flowers using collage and crayon. Bring your garden to life by adding some bees and butterflies. Happy, sad, angry or glad, will look at our facial features and expressions and make a busy composition of faces in a crowd. We’ll transform a row of bottles into an amazing colourful abstract design, using shades of green and a splash of red. Let’s make a futuristic sculpture, it could be a robot or, a spaceship to take us to the moon. Use your imagination and creative skills to make a fun sculpture out of paper and cardboard. We will look at paintings with houses and buildings and then make a cozy and sleepy night-time cityscape. Let’s look at insects and small creatures and see how many we can draw on our page, using collage and pencils. Food is fun to eat, and fun to draw. Let’s create a smorgasbord of our favourite foods using pencils and watercolours.